The Liberal Democratic Party won a landslide victory in the 46th House of Representatives election on December 16, 2012, securing 294 seats, well above the 241 needed for a majority in the 480-seat chamber. With its coalition partner New Komeito added in the LDP-Komeito coalition won a combined 325 seats, exceeding the 320 seats needed for a two-thirds majority. The election victory put the LDP back in power after three years and three months in opposition. A two-thirds majority allowed the LDP-Komeito alliance to override the House of Councillors by passing bills into law through a second vote in the lower house. The Democratic Party of Japan suffered a humiliating defeat, taking only 57 seats, fewer than a quarter of the 230 seats it held before the election. Eight incumbent Cabinet ministers lost their seats, including Chief Cabinet Secretary Osamu Fujimura and education minister Makiko Tanaka, the highest number in lower house elections conducted under the current Constitution. After the elections former Prime Minister Yoshihiko Noda resigned as DPJ president.Nippon Ishin no Kai (Japan Restoration Party), anticipated as a possible third political force, won 54 seats, becoming the third-largest party in the lower house. Nippon Mirai no To (Tomorrow Party of Japan) was soundly defeated, falling from 61 seats to nine. A dozen parties fielded a total of 1,504 candidates, the largest number ever. But in a sign of the election’s failure to excite, only 59 percent of voters cast ballots, one of the lowest turnouts on record. Taking responsibility for the DPJ’s loss, Noda said, “We failed to meet the people’s hopes after the change of government three years and four months ago.” In a sign of how far the pendulum had swung against the incumbents, former Prime Minister Naoto Kan lost his seat in a Tokyo suburb in a tight race with a relatively unknown Liberal Democratic challenger. In Hokkaido Constituency No. 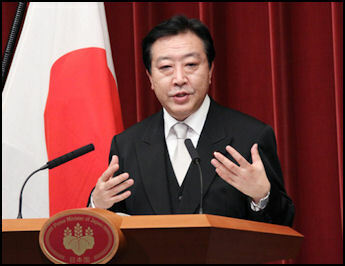 9, which former Prime Minister Yukio Hatoyama represented before he announced his retirement, LDP newcomer Manabu Horii was certain to win the seat vacated by Hatoyama. Ichiro Ozawa, an influential member of Nippon Mirai no To (Tomorrow Party of Japan), retained his seat in Iwate Constituency No. 4. Shintaro Ishihara, leader of Ishin no Kai, was sure to win a seat in the Tokyo proportional representation bloc. His son Nobuteru, former LDP secretary general, also was to retain his seat in Tokyo Constituency No. 8. Ishin no Kai was did especially well in the proportional representation blocs. In the 10 days following the launch of the Facebook page on Nov. 20, about 4,000 people clicked the "Like" button. The committee said it seems its new project has been well received, despite some criticism about whether it is "really necessary to use pop idols to encourage people to vote?" While candidates and campaign staff argue the regulation is outdated, Internal Affairs and Communications Ministry officials say such acts could be considered violations of the law. When an incumbent lawmaker delivered a campaign speech Thursday in Tokyo, one of the campaign staff told supporters there, "When you write on blogs or Twitter, please indicate 'One vote [for the lawmaker].'"